Instrument P.I. : Peter Jenniskens, SETI Institute. The information below will be updated as more precise data is received. Technique: Slit-less spectroscopy with transmission grating, long focal length lens, and a cooled CCD camera detector. Scientific objective: Spectral resolution of shock layer radiation. Resolve spectral lines of air plasma emissions at optical wavelengths for the measurement of excitation temperatures. Provide high spectral resolution and absolute calibration at high dynamic range. Limitation: only one measurement made in a brief time interval during the point of peak brightness. Instrument: This instrument consists of a Richardson Grating Laboratory 11 x 11 cm plane transmission grating (35-54-20-660), an AF-S Nikkor f2.8/300 mm Nikon 300D IF-ED lens, and a two-stage thermoelectrically cooled back-illuminated 1024 x 1024 pixel Pixelvision CCD camera. An optional order separation filter. Heritage: The ASTRO camera was deployed before for meteor spectroscopy in the 2002 Leonid MAC mission. Same setup. Aircraft hardware requirements: Fix mount. Window mount on 60� port, control unit on medium rack, laptop computer in rack, electricity in rack. 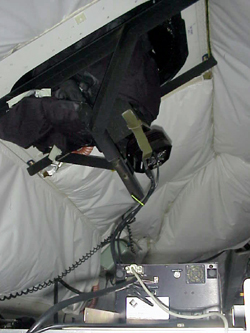 Instrument validation tests: This camera has been used extensively in past missions. Laboratory check on spectral response. Sensitivity: An 0.1 second exposure results in +10.6 magnitude stars being detected. Dynamic range: 16-bit (factor 65,536). Frame rate and exposure times: The camera has a 5 degree field of view and can measure the SRC emission over a 5 degree length of path. The SRC will move at a rate of about 0.88�/second, accelerating, in azimuth. The exposure time is chosen such that integration on the star background is not dominating the image. Typical exposure times in past campaigns: 0.1-0.8 seconds. After each exposure, there will be a 1 seond read-out time (full frame, or less with binning, binning option 1x4 in spatial but not in spectral direction). Period covered: 49s until 55.7s, equivalenth to 63.5 to 57.6 km altitude range around the time of peak heating (and peak brightness). 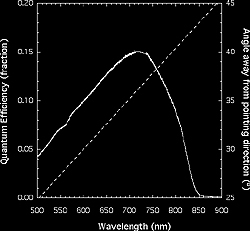 Number of spectra (time resolved): up to 100, each representing about 0.02 degree of motion on the sky. In first order: 0.26 nm. Full wavelength range: 137 nm, centered on central wavelength depending on the angle between viewing direction and the SRC. Dispersion is 0.1338 nm/pixel. We anticipate aiming for 743-880 nm, centered on 811.5 nm, or 41 degree angle between viewing direction and SRC. The SRC will be at 12.1 degree elevation, needing the camera to be mounted at a 53.1 degree angle with respect to the horizon. The window is at a 62� angle.